For those of you who enjoy making your baked goods with whole wheat flour, then this recipe is just for you. A healthy choice for your next batch of delicious blueberry muffins. This recipe uses half all-purpose flour (plain flour) and half whole wheat flour. If desired, you may use all whole wheat flour in this recipe. Coarse white sugar may be purchased online at Kingarthurflour.com and at amazon.com and at other online stores. 1. Preheat oven to 425 degrees F/220 degrees C. Grease or line with paper muffin cup liners a 12 cup muffin pan. 2. Combine dry ingredients in large mixing bowl and mix well. 3. In a separate bowl, toss 1 tbsp. of the dry ingredients with the blueberries; set aside. 4. Stir the eggs, milk and vanilla into the melted butter. 5. Quickly and gently combine the dry and wet ingredients. As soon as everything is evenly moistened, stop stirring, because further stirring will cause the muffins to be tough. Fold in the blueberries. 6. Spoon batter into prepared muffin pan, filling the cups about 2/3 full. Sprinkle tops with a bit of coarse sugar. 7. Bake in preheated oven for 15 to 20 minutes, until deep golden brown (fresh berries - check after 15 minutes, frozen will take about 20 minutes or maybe a bit more). Leave muffins in pan for 5 minutes before transfering to a wire rack. Serve slightly warm or at room temperature. 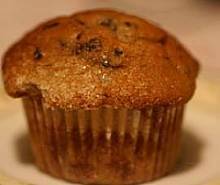 This Muffin is delicious. I appreciate all the detailed oriented instructions. All the tips you have given in this website are very useful. I used honey instead of granulated sugar and vegetable oil instead of butter, no blueberries, because my mom has diabetes, a healthy snack for her. Thank you.